Robots are going mainstream. Becoming more affordable and easier to program, they are widely present in our everyday life. You name the field, the robots are there: agriculture, tourism, e-commerce, medicine… They even help with household chores. With the accelerating speed of robotics development, it appears a very tempting field for investment. Last month, Credit Suisse's Global Equity Research team published a report examining its potential. We have already accepted big robots working in agriculture (e.g. milking systems) or the automotive industry (e.g. car assembly), but with their components devices becoming smaller and more precise, the robots should follow suit. Some of them, such as smartphones or sensors in cars, have already become an integral part of our lives; others, such as robots with tactile sensing, are still on the way. What is more, we can only try to guess what projects are running in the labs. Thanks to advances in technology, robots are being used in fields traditionally occupied by humans. These days, machines not only move heavy pallets, but also pick tomatoes, pass credit cards and serve lattes. Unmanned aerial vehicles (UAVs), aka drones, instead of a postman, take care of same-day parcel deliveries. A driver’s licence may no longer be necessary to travel by car. Artificial Intelligence (AI) allows companies such as Volvo, GM, Audi, Nissan and BMW to work on fully autonomous cars. They are expected to go into production within five years and Google is set to release its autonomous hybrid Toyota Prius in 2018. Not only robots have been changing. Our perception of them has been changing as well. Some things which would have never been accepted a decade ago are now taken for granted. And the trend is certain to continue. "This is a sensitive area," says Peter Hensman, global strategist at Newton, "How would people feel if their healthcare assistant was a robot? Perhaps not terribly comfortable. However, attitudes can change. People would once have been very uncomfortable with voice recognition systems but these applications are now commonly used by many without a second thought. A lot depends on perception and comfort with these new concepts." The statistics prove that the shift in our perception is happening already: the number of surgical procedures performed with the help of robots to provide greater precision increased 16 percent in Q1 2016 compared to Q1 2015. Robots are present not only where strength or precision is needed. With shrinking farmland, growing populations and the need to increase food supplies, agriculture is another field likely to benefit from robot use, such as driverless tractors, drones, or swarm robots for the harvest season. They could cut costs and be suitable even for indoor farming. According to the "Agricultural Robots" report by Tractica, by 2024 annual shipments of these robots are likely to reach 992,000 from 33,000 in 2015. Personal household robots help us with the "dirty work." At the Starwood Hotel in Palo Alto, California, robots exchange towels, and robot vacuum cleaners are sold widely both in Europe and the US. There is also Jibo, a "family robot" designed by the Massachusetts Institute of Technology which recognizes different family members and reads stories to children. In the mainstream consciousness, robots are R2-D2 creatures, but one cannot forget that they are much more. Leaving the hardware part aside, every robot needs an operating system which enables it to perform its actions. For example "driverless cars need a software to control them," says Uwe Neumann, Credit Suisse Equity Research Analyst, "The fact the car is produced by Mercedes doesn't mean Mercedes produces the software. It is produced by companies which specialize in it." Although probably still some way from its full investment potential, the robot sector seems promising for further development. "We can observe positive trends in this market. For now it is more of an evolution, but it is accelerating," says Neumann. Tractica estimates that the next five years will revolutionize the way we think about robots. Non-industrial robot revenues are likely to grow 10-fold within this period, and with the development of AI, Big Data Analytics and the Internet of Things we will start to perceive robots not only in hardware, but also in software terms. For investors it is an important hint. The potential of robotics has been already recognized by some governments. Japanese prime minister Shinzo Abe proposed including it in the country's growth plan. Launched in 2014, the plan assumed 20-fold growth in the use of robots in agriculture and two-fold in manufacturing by 2020. With Japan's population declining, robots should help boost productivity. Although people are afraid of job losses, robots could take on the dangerous and dirty jobs which humans should not or do not want to perform. 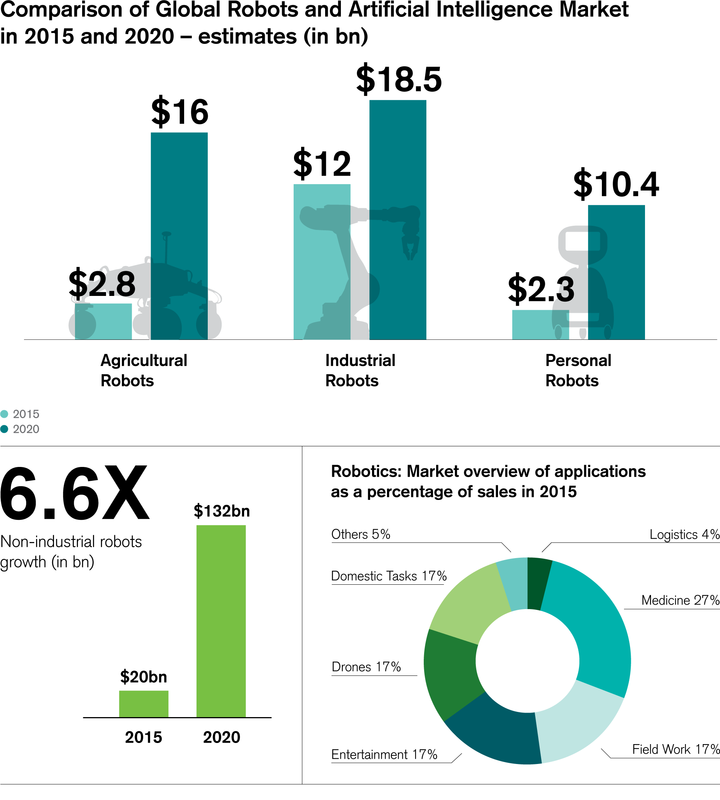 "Around the world, new players and markets are emerging to assume an important role in the ongoing development of the robotics industry," says Tractica research director Aditya Kaul. "Technologies like AI, machine vision, voice and speech recognition, tactile sensors, and gesture control will drive robotic capabilities far beyond what is possible today, especially in terms of autonomy." With advancing technology, robotics opens a new investment world with plenty of options. One can invest in hardware or software, both on the rise. "Given the variety of potential capabilities, investing in different application segments of the robotic market makes most sense," claims Neumann. Both big players on the market and startups which offer tempting high-yield investments and a group of future-oriented investors in robotics are growing. The future is here. It seems that robots will stay with us for good and that they will become more and more advanced. The robotics evolution definitely provides some food for thought for every investor.